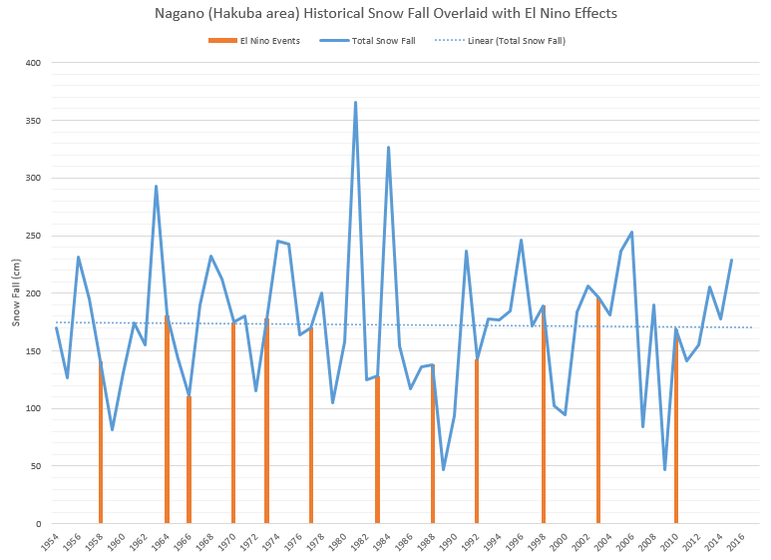 What effect will El Niño have on the Hakuba region? Between 1954 and 2014, JMA recorded an average annual snowfall in the Nagano region of 173cm. During the 12 El Niño cycles listed below, 7 years had snow fall below the average and 5 years had snow fall above the average, indicating that an El Niño cycle in the Nagano region is historically likely to produce below-average snow fall conditions. The blue line in the chart below denotes how much snow fall was recorded by the Japan Meteorological Agency (JMA) for the time span of 1953 to 2014 (years located on the X-axis). The intersecting orange bars indicate El Niño years recorded by JMA for Japan. While some El Niño years such as 1966, 1983 and 1992 show a decline in snow fall during El Niño period, most of the other years show that nothing much happened during the El Niño cycle as snow falls remained as variable as they usually are. How does Hakuba compare to other regions in Japan? The chart above shows historical snow fall data for the city of Nagano, one hour from the main Hakuba base. The elevation of Nagano is 400m while the main Happo-One base at Hakuba is located at an elevation of 760m. As mentioned above, the weather systems between Hakuba and Nagano vary significantly with Hakuba receiving much more snow than Nagano. However, it may be possible to extrapolate general trends in the region by analyzing historical weather data from the JMA Nagano weather station. The first thing you should note about this chart is that the Japan Meteorological Agency (JMA) doesn't have a weather station closer to Hakuba than Nagano (from what this investigator could figure out). While Nagano is relatively close, it does get significantly less snow than Hakuba. However, given that they're in the same region and prone to the same general weather influences, the data for Nagano should reflect the overall conditions of Hakuba.